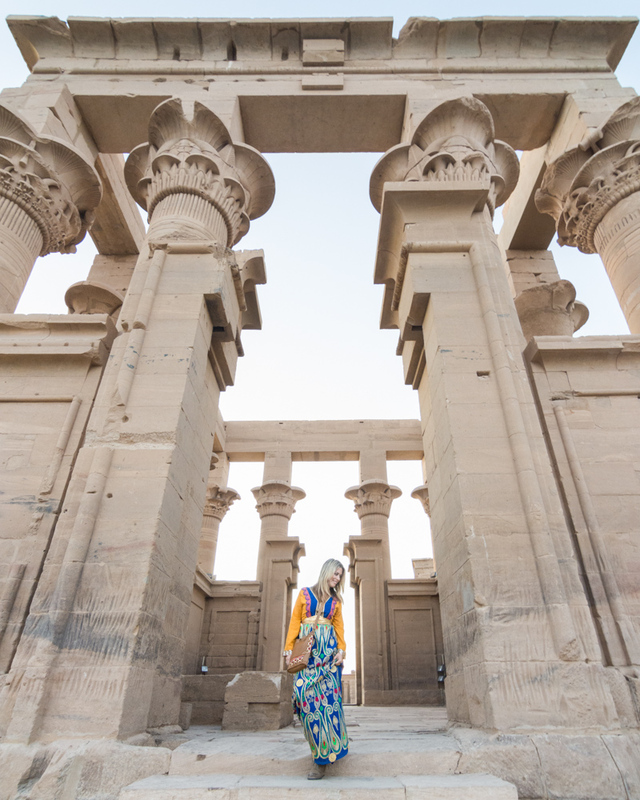 Prior to stepping on board the Sonesta Star Goddess Cruise ship in Aswan, traveling around Egypt had been quite a bit more difficult than we originally anticipated. The constant touts shouting at us to get in their taxi, or ride their horse-drawn carriage, or buy their Egyptian scarf. Haggling over prices for everything from a bottle of water at a market to the price of a boat ride that was originally stated as being a much lower price. We were feeling exhausted and were ready for some rest and relaxation. We wanted our 4 days onboard to be… easy. And from the moment we stepped onto the ship it was just that! We dined on delicious meals that varied daily, we had a knowledgeable and friendly guide to arrange our transport to the temples and to provide us with an overview of Egyptian history, and the friendliest of staff onboard helped us with anything and everything we needed throughout our stay. This cruise was everything we were hoping it would be and so much more. 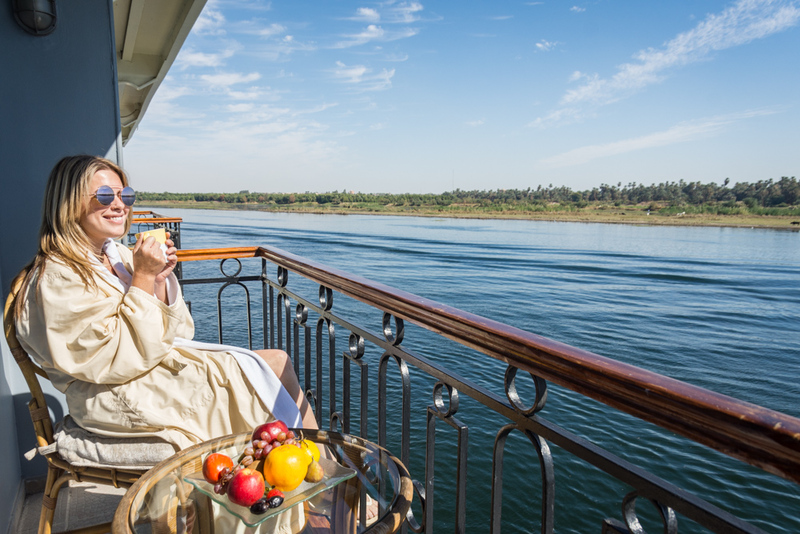 The Greek historian Herodotus wrote “Egypt was the gift of the Nile” but we’d argue that taking a luxury cruise ship tour is truly the gift of the Nile. It was most certainly an experience of a lifetime! 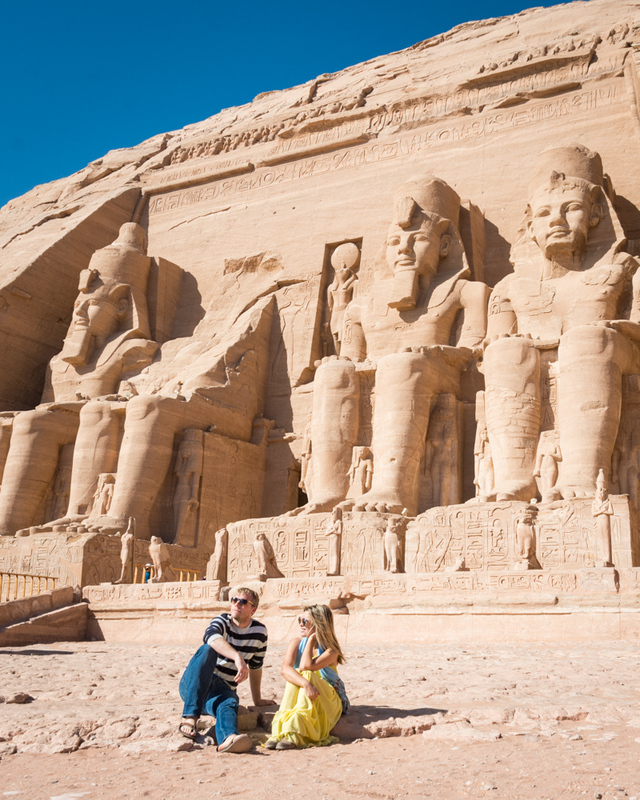 Note: We opted for the Sonesta Star Goddess 3-night, 4-day cruise from Aswan to Luxor that departs every Friday but Sonesta Cruises offer a variety of options at differing price levels, differing lengths of time, and embarkation in either Luxor or Aswan. At 4,258 miles long, and spanning 11 different countries, the Nile River is regarded as the longest river in the world. Not only is the Nile an important source of sustenance and transportation in Egypt, it is also considered to be a spiritual landmark. In ancient times it was thought to be the causeway from life to death to the afterlife (which may explain why a full-sized boat was included in the tomb of Pharaoh and is now on display in the Pyramids of Giza). The east side of the river was a place of birth and growth and the west was the place of death which is why all of tombs were constructed west of the Nile. The Nile is central to many ancient Egyptian beliefs and stories. They believed that Nut, the god of the sky, ate Ra, the god of the sun every night and then gave birth to Ra again every day at dawn. But prior to being birthed, Ra had to get 12 boats safely across the Nile River and battle dangerous snakes and crocodiles along the way. Ancient Egyptians even based their calendar on the cycles of the Nile and called them Akhet, Peret, and Shemu. Akhet was the Nile flood season, Peret was the growing season, and Shemu was the harvest season and each cycle was approximately 4 months long. You’ll learn all about the ancient Egyptians, their gods, and the importance that the Nile had on their culture during your journey down the river! Be sure to have small change on you for a “baksheesh”, or tip. You’ll need to tip your car, boat, and carriage drivers on your daily excursions as well as the bellhops that carry your bags to your room. Egyptians speak Arabic and you should learn a few key phrases to get around. “Al Salam Alaikum” (pronouned sall-em wall-a-come) is a nice way to say “hello”. “Shukran” (pronounced shoo kran) is “thank you”. “Ma’-Elsalama” (pronounced ma sell lem-a) is “goodbye”. Tip the cruise ship staff at the end of your stay, not at every meal as the tips will be split equally between the staff you see daily and those you don’t. 100-150 LE per guest per day is appropriate for the cruise ship staff. If you opt for a guide for your daily excursions, a tip of 100 LE per person per day (depending on group size) is the standard tip rate. You’ll spend your mornings exploring temples in the heat and your evenings enjoying the sunset from the top deck of the ship and it cools off quickly as soon as the sun sets. Pack light breathable clothing, sunglasses, a brimmed hat, sunscreen, and comfortable shoes for the daytime. And a warm sweater for the evenings. Something on the fancy side for evening dinners and entertainment would be recommended as well. 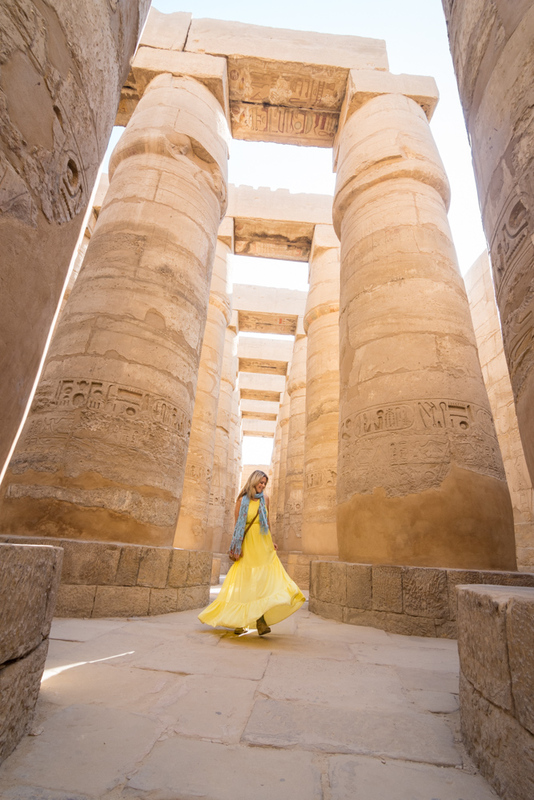 The Sonesta Star Goddess Cruise line departs from Aswan so if you arrive early and give yourself a few days to explore, these are the top destinations to be sure not to miss! Take a day trip to Abu Simbal Temple – it takes about 3 hours by car to get to Abu Simbal Temple but the trip is most certainly worth it! This massive temple was actually deconstructed, piece by piece, and moved to higher ground when the Nile was dammed in the 1960’s. You can arrange a private taxi for around 1200 LE (per car) if you want more time and flexibility to explore the temple. Or you can arrange minibus transport for 265 LE (per person) that will leave at 4:00am or 11:00am but you’ll only get 1.5 hours at the temple before heading back. Visit a Nubian Village – Elephantine Island is a short boat ride from the downtown area of Aswan and allows the opportunity to wander through both a traditional Nubian Village as well as ancient ruins that are in the process of being uncovered and reconstructed. The botanical gardens across the way are an excellent stop for a stroll as well! Shop at the Sharia as-Souq – the old Aswan market runs parallel to the Nile River and comes alive at night. You’re sure to find all of the Nubian souvenirs and snacks that your heart desires in this colorful, bustling market! 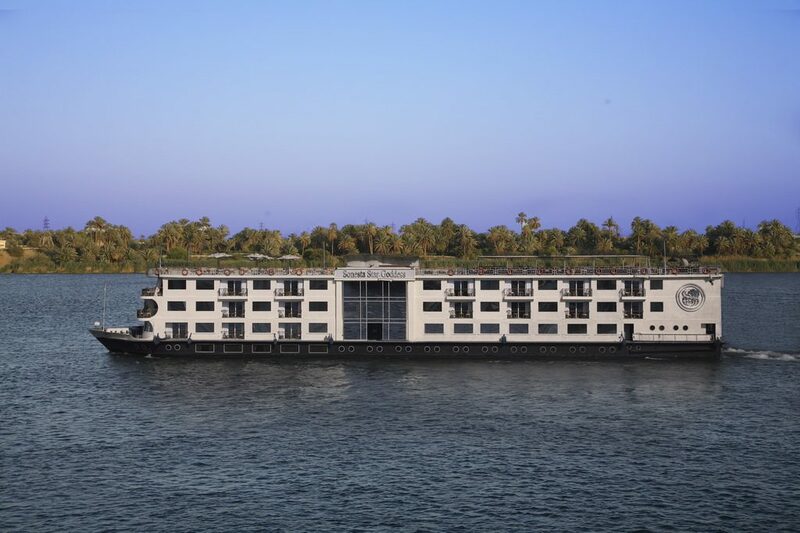 The Sonesta Star Goddess is the premiere 5-star, all-suites cruise line and allows it’s passengers to travel up or down the Nile between Luxor and Aswan in comfort and class. Stops along the way allow passengers to explore the ancient temples and tombs through guided excursions. 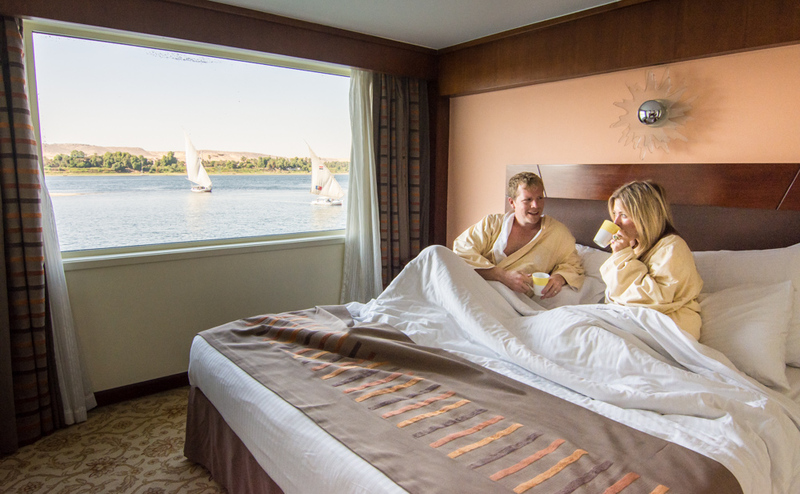 Large, luxurious suites feature comfortable bedding, large bathrooms equipped with full-sized bathtubs, panoramic windows showcasing the gorgeous views along the banks of the Nile as well as private terraces where passengers can enjoy sunrise or sunset from the comfort of their own room. The food on the ship will definitely be the best you’ve had in Aswan, and possibly the best you’ll experience in all of Egypt! Sun Deck Bar & BBQ – barbecue specialties and delicious cocktails while overlooking panoramic views of the Nile – the perfect place to spend an afternoon! 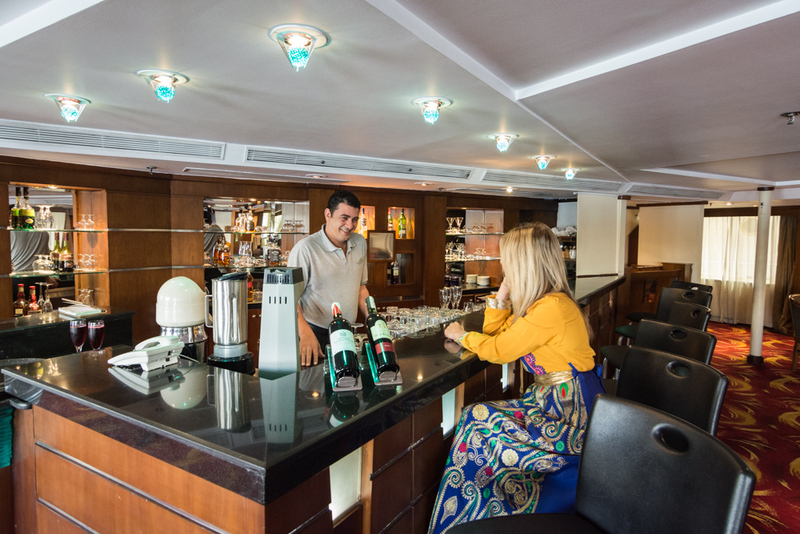 The Lounge – cocktails and light snacks are served in The Lounge, near the lobby of the ship which also features a dance floor for your evening entertainment! After enjoying a delicious lunch onboard the ship, you’ll disembark in the early afternoon to explore Aswan with your knowledgeable guide. 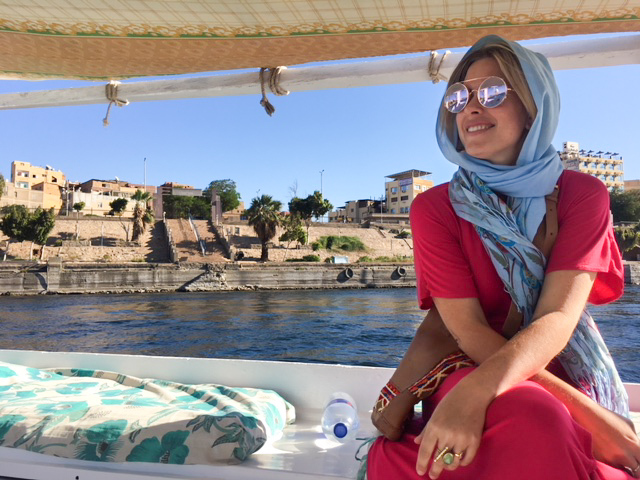 You’ll start with a relaxing felucca ride around Kitchener’s Island where your guide will give you a history on the temples and ruins you’ll pass on the banks of the river. You’ll disembark and move to a minivan that will take you to the Granite Quarries (entrance fee: 60 LE/person) which contains a giant, sadly unfinished obelisk that cracked before it was complete. If finished, the obelisk would have been the largest in the world. From there you’ll head to the High Dam where you’ll learn about how it was constructed and about all of the Nubian villages that were flooded and the ancient temples that had to be moved due to the damming. 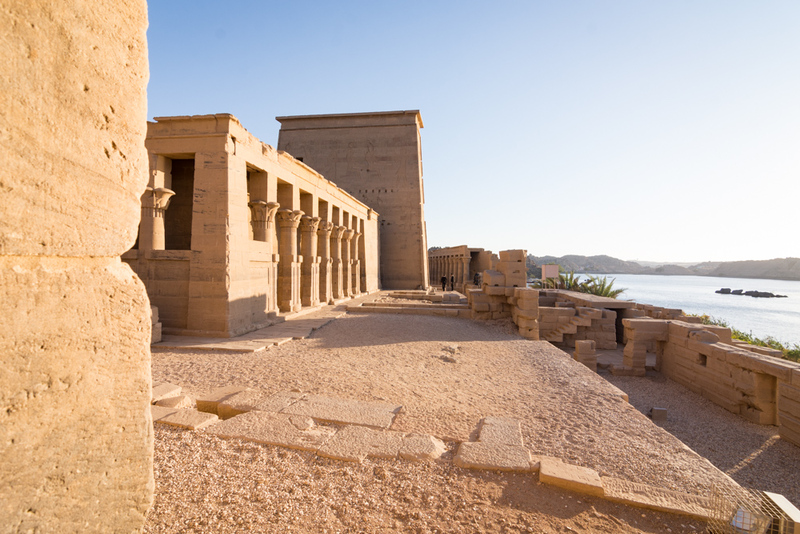 Your final stop of the afternoon will be the Temple of Philae (entrance fee: 100 LE/person) which is on an island and was moved from it’s original location to keep it from damage from rising river waters. The temple is massive and was erected by the Greeks when they ruled Egypt so most of the gods depicted are in the traditional Greek style with round, soft bodies. You can see the water lines from the flooding that occurred before the Nile was dammed. Side Note: you’ll need small change to tip your boat and minivan drivers and it can be difficult to get change onboard. 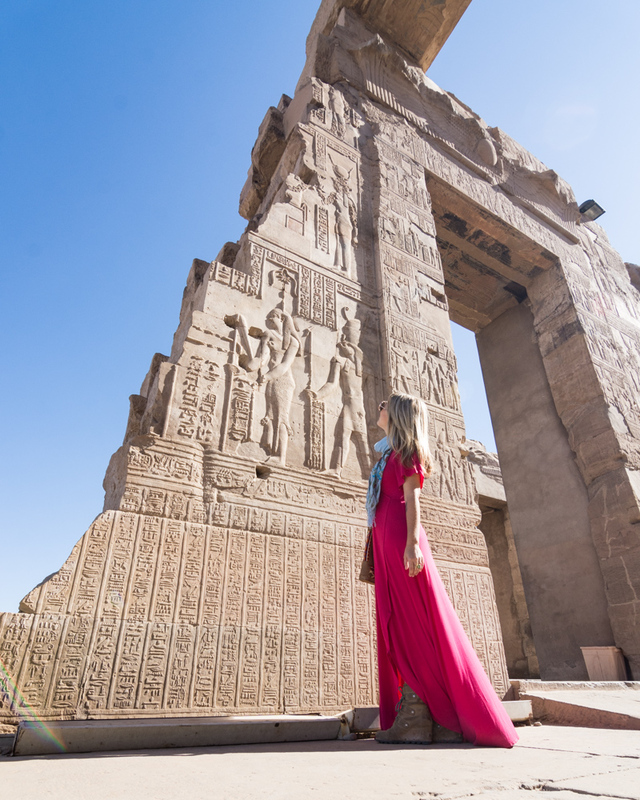 After a delicious breakfast buffet you’ll begin your day with a tour of the Kom Ombo Temple (entrance fee: 80 LE/person) which is just a short, 5 minute walk from the point of disembarkation. The area around the temple holds many uncovered treasures so excavations continue to this day. Hundreds of mummified crocodiles were found nearby and many are displayed in the small but intriguing museum near the exit. After wandering around all morning, take solace from the midday heat in the infinity pool overlooking spectacular views of the Nile. Lounge in the comfortable chairs during your 3-hour break as you pass by the stunning scenery on the banks of the river. 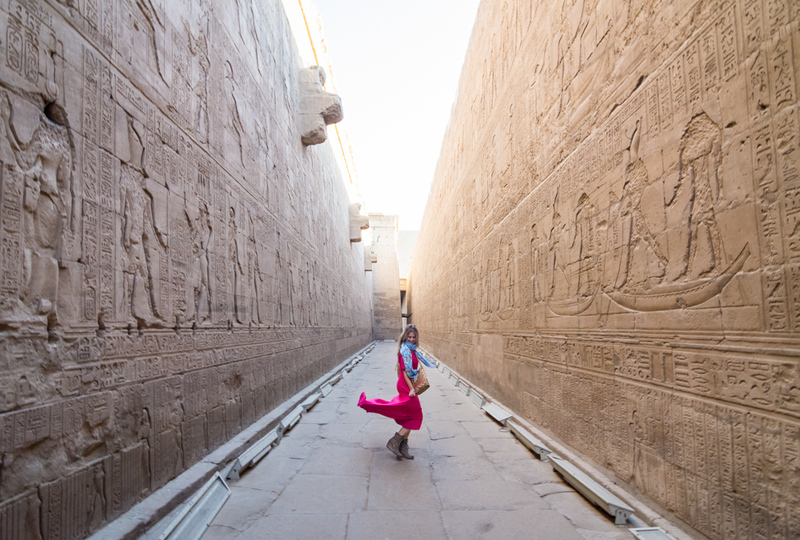 Your final stop for the day is Edfu Temple (entrance fee: 100 LE/person) which is a massive and incredibly well-preserved Greek-style temple. You’ll enter the towering gates into a large central courtyard which was filled with mud from the Nile waters for many years. That mud actually helped to preserve many of the carvings from damage from the elements as well as people who wanted to destroy the ancient gods by making scratches in the rock. After your exploration of the temple, you’ll have afternoon tea on the top deck of the boat where you can watch the beautiful sunset cast pink hues on the calm river. 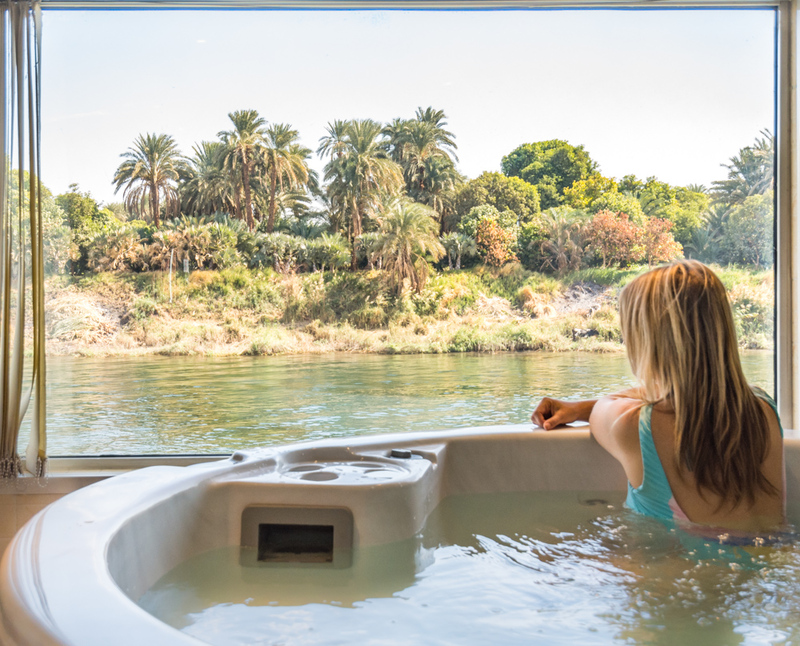 Between afternoon tea and dinner is a great time to soak your tired muscles in the hot tub which also offers stunning views of the Nile from the large picture window. Enjoy a lively galabeya party after dinner! If you haven’t already purchased a galabeya, the small shop onboard has several styles for sale (of course, you can attend the party even if you aren’t dressed in a traditional costume). Fill up on the delightful breakfast buffet as you have a long morning of exploring temples ahead of you! You’ll start with a quick stop at the Colossi of Memnon which are two large statues that were originally carved from a single piece of limestone. One is intact and original and one has had quite a bit of reconstruction. This valley is full of tombs that archaeologists are working hard to uncover to this day. Communities of people are being relocated so that their houses can be demolished and digging underneath can begin. From there you’ll head to the Valley of the Kings (entrance fee: 160 LE/person to see 3 tombs; photography ticket fee for 3 tombs: 300 LE/camera; 2-way tram ticket: 4 LE/person; King Tut tomb entrance fee: 200 LE/person; Seti 1-Tut tomb entrance fee: 1,000 LE/person). Intriguingly, ancient Egyptian kings would begin the construction of their tombs on the day they were crowned king. Some kings like Rameses III reigned for quite a long time so their tombs are incredibly long and intricately carved and painted. And others, like Rameses IX did not enjoy a long life so their tombs had to be completed in haste (when the king died, the workers had 70 days to complete construction of the tomb as that was the length of time needed for mummification of the body). There are currently 8 tombs available for viewing but 2 require an additional fee. Of the 6 remaining, you’ll need to choose only 3 to visit (unless you purchase 2 entrance tickets). The tombs that have the best preserved colors are the tombs of Rameses IV, Rameses III, and Rameses IX. The tomb of Rameses III is not to be missed! Guides are not allowed inside. Your guide will give you good information ahead of time to ensure you don’t miss any important details inside of these spectacular, elaborate tombs! Your next stop is the Al-Deir Al-Bahari Temple (entrance fee: 80 LE/person; 2-way tram ticket: 2 LE/person) which was originally constructed as a funeral temple for use by King Hatshepsut who is famous for being the only confirmed female pharaoh. After the death of her husband (also her half-brother), she claimed that the gods turned her into a man and was thus able to rule as king. She is depicted as a man in all Egyptian statues and it was only at the discovery of her lover’s tomb in the 1900’s that archaeologists realized she was actually a woman. Unfortunately all of the statues and carvings depicting Hatshepsut in this temple were destroyed by her angry stepson, Thutmose III. Your final stop today will be the Valley of the Queens (entrance fee: 80 LE/person) where you can enter the tombs of 2 different queens which are quite a bit smaller and less elaborate than their male counterparts. If you’d like to see the tomb of Nefertari, the favorite of King Rameses’s 34 wives, you’ll need to pay for an additional ticket for 1,000 LE/person. You’ll have the afternoon completely free to do whatever you desire! Lounge by the infinity pool, take a dip in the hot tub, or relax on your private balcony while sipping coffee and enjoying the river. Then at 7:30pm, head to the lounge, order a glass of wine, and relax while enjoying the nightly entertainment before dinner! 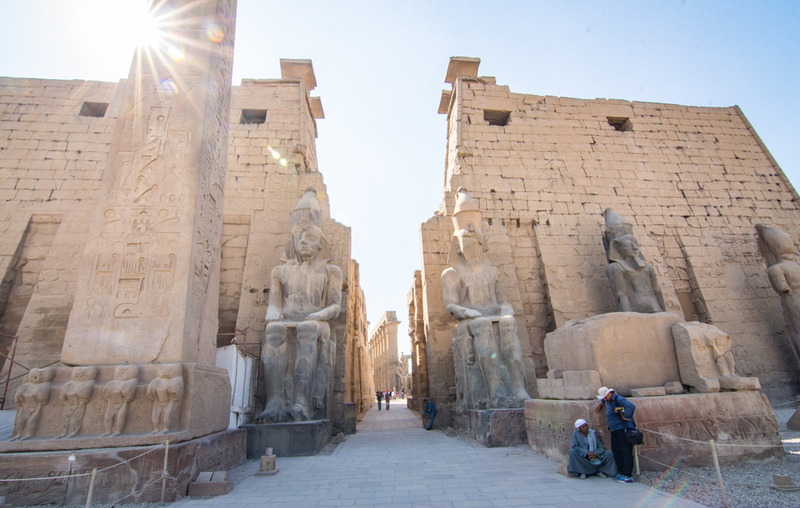 These temples in Luxor will be the highlight of your cruise excursions! 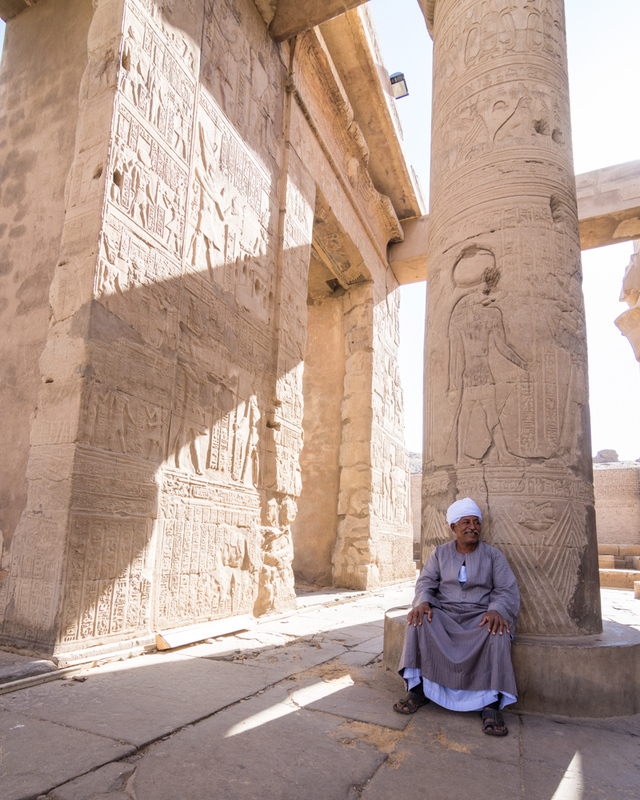 Your first stop will be the Karnak Temple (entrance fee: 120 LE/person) where you’ll wander through 134 well-preserved columns. You’ll see damaged images of King (Queen) Hatshepsut throughout the temple as she made more than a few offerings here so that the priests would accept her as a pharaoh. 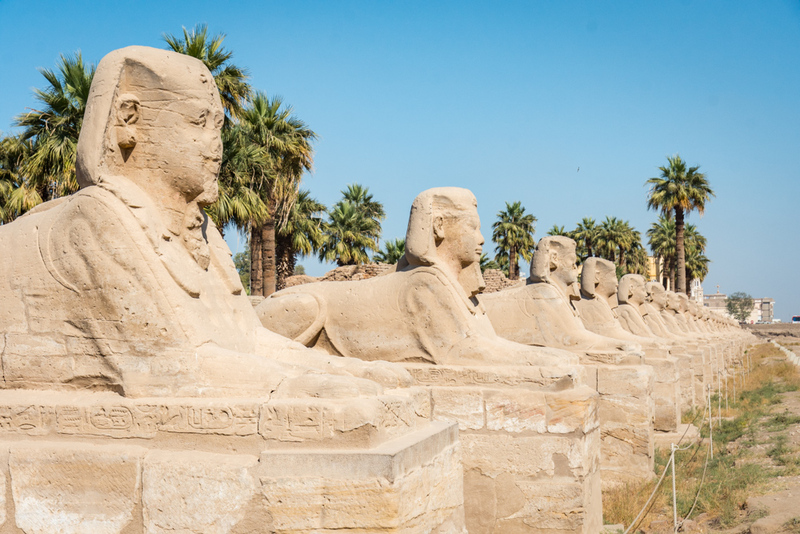 A road of sphinxes connects the Luxor Temple to the Karnak Temple and it is expected that when excavations are complete, somewhere in the neighborhood of 6,000 – 7,000 sphinxes will be discovered. Many buildings along this road, including a 200 year-old mosque, were destroyed to make way for the excavations. Just 5,000 more to go! 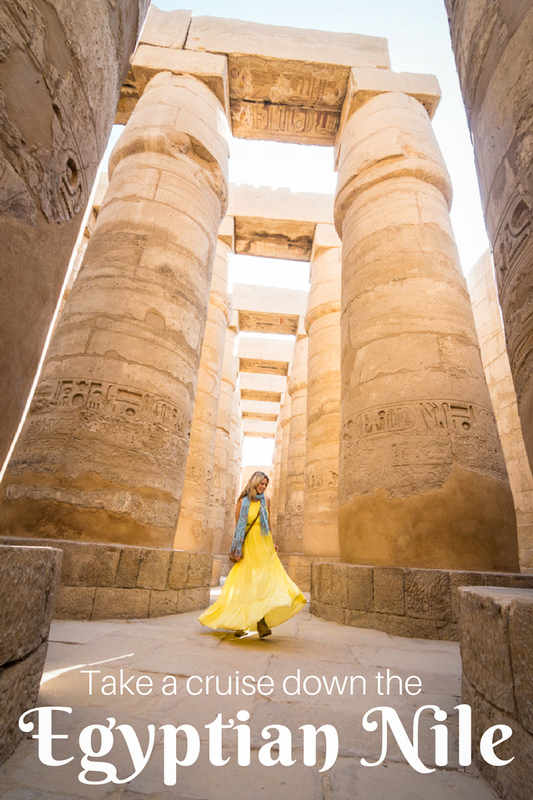 Your day of excursions will end at the Luxor Temple (entrance fee: 100 LE/person) where you will find evidence of 5 different cultures in one place – Roman, Greek, Christian, Islamic, and ancient Egyptian. You’ll pass by the oldest mosque in Egypt and a headless Greek statue on your way into the temple. You can see where Romans attempted to cover the ancient Egyptian carvings with their own paintings during their reign. 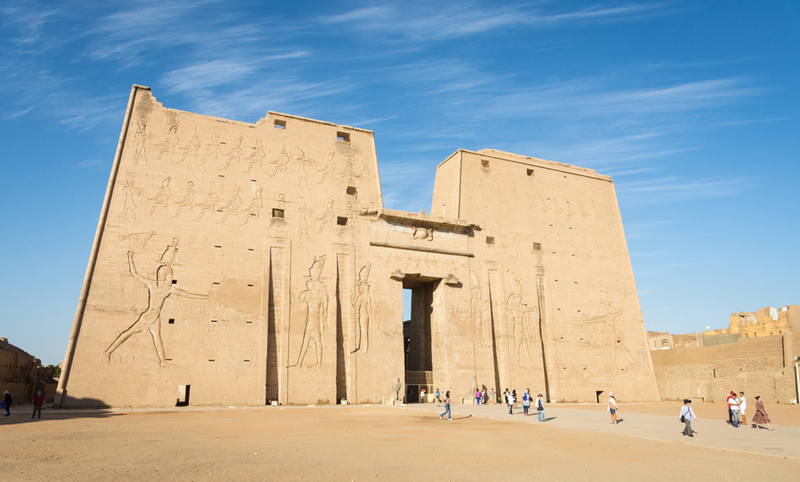 For more information on Luxor make sure you check out our other post! Exploring these spectacular temples will be the perfect way to end a perfect 4-day excursion on the Sonesta Star Goddess Cruise ship! THIS!! I love this cruise you guys did! I have it on my bucket list to take a Nile River Cruise and Egypt has always been of interest to me since i was in Middle School back in the 80s!! I love this adventure. So I may have missed it but did you book your excursions ahead of time or are they included in the cost of the cruise? I have never even heard of Asway but I would love to explore those temples and ruins. Also is there an ATM on the boat cause it seems that you are constantly tipping which is fine but I dont want to bring an extra suitcase for all the Egyptian pounds you seem to need! I’ve done a similar Nile cruise with a different company. They are astonishingly luxurious! And, what you see is just unbelievable. What was your favourite part? I particularly liked the mummified crocodiles at Kom Ombo museum – but maybe I am just a bit macabre? I had no idea you could do a cruise on the Nile! This sounds so fun! I would love to try this it seems like a great way to see alot of great stops without having to pack and unpack everyday! I did this trip when I was 15 (which was 31 years ago) and it is still with me today. We took the railroad from Cairo to Aswan and then started our cruise. I distinctly remember 5:00 in the airport when we were the only people standing. We had just come from Paris and I could recognize the missing obelisk that I just saw in the Palace de la Concorde. I also remember the dust storm that came in one night and the visibility dropped to zero. Your pictures are beautiful and the trip looks like it was great luxury. Our boat felt a little older and I don’t remember the opulence of your trip. Sitting in a hot tub and watching the scenery roll by looks amazing. I was supposed to travel to Egypt this winter but the plan didn’t pan out unfortunately. 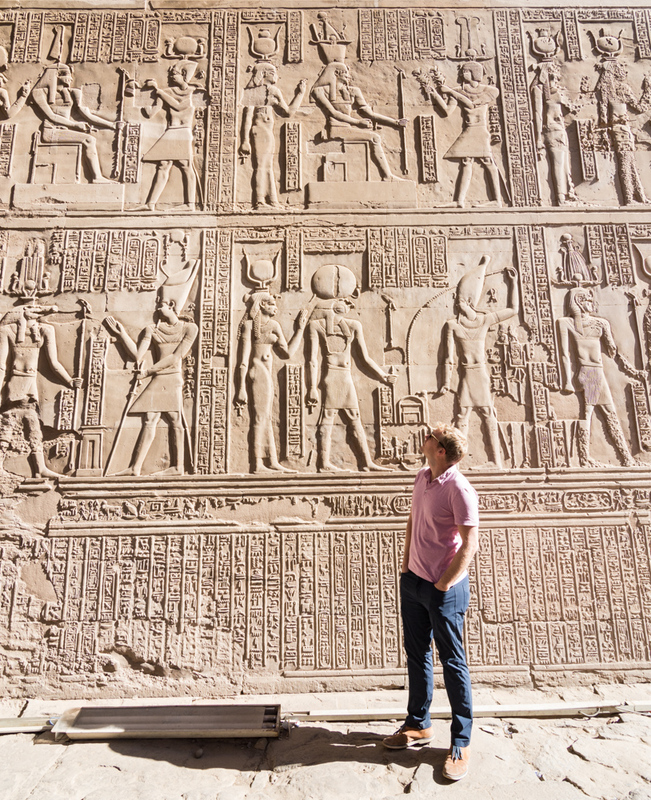 I was planning to do a 5-day cruise on the Nile and was having a tough time picking the right itinerary. I really wanted to visit Luxor and Abu Simbel temple (and I see from your pictures that it’s totally amazing) but wasn’t fixed on any other cities. I like your itinerary, it’s short and sweet! Thanks for the tips. 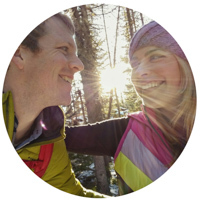 This exact trip has been high on my bucket list for years- so glad to hear you enjoyed it! Sadly we haven’t made it to Egypt yet as I’m turned off by what you described at the beginning of your article about being hassled. I hope the country is able to turn itself around soon so I feel more comfortable booking a visit. 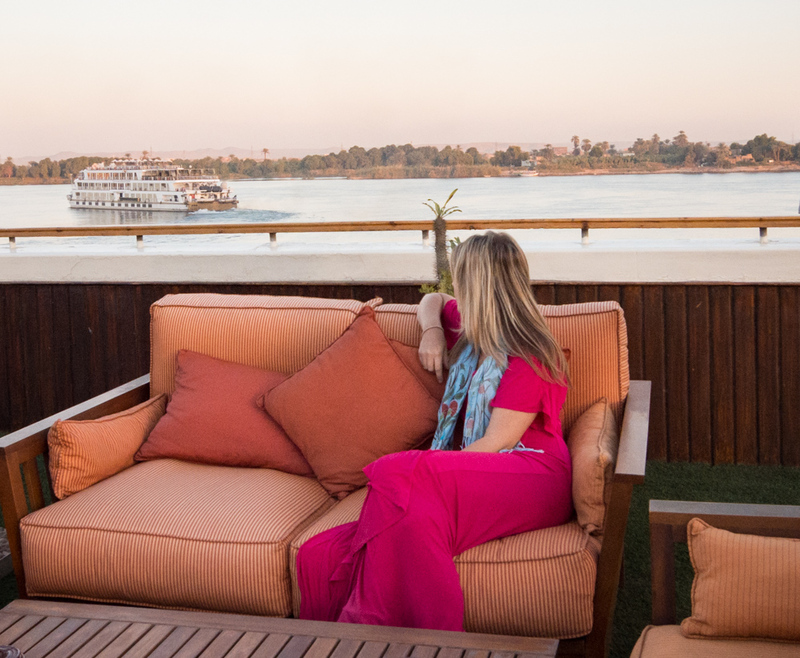 I’m not much of cruiser but being able to explore Egyptian temples by day and relaxing in luxury at night this Nile cruise is right up my alley. I love that they include local Egyptian culture in their onbaord entertainment too. Love the featured image, awesome. When I was a teen (and still now) I was completely facinated by Egyptian history. Pharoah’s. the pyramids, the sphinx, the nile, mummy’s etc… This well put together post brought all that back and got me wondering how it fell off my to go to list…I want to see it all: Nubian Village, Temple of Philae, Edfu Temple, Luxor Temple and i think this is a fantastic way to explore it all. Oh, this brings back memories, although I didn’t have the luxe level experience you did. Now that is the way to do it. Even so, Abu Simbal Temple was a standout and Luxor! I didn’t realize that there will be such an endless row of sphinxes after the excavations. That would be something to see. This sounds so awesome! I would like to check this out. Egypt is high on my list and of course seeing everything. Going down the Nile just sounds super cool. It is always interesting to see the different cultures amongst everything because of the different invasions and reigns. Funny how one tried to cover up the others stuff.